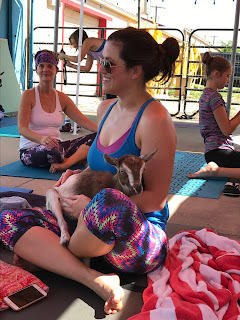 This past weekend, I went to Goat Yoga. I think it normally costs about $35, but I actually won my ticket to class. 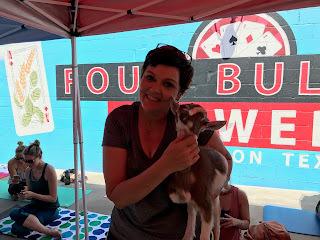 It was held at Four Bullets Brewery- but no, I wasn't drinking beer and doing yoga and playing with goats. It was only 10am! It may sound sort of rowdy and crazy, but actually, it wasn't. If you haven't heard about Goat Yoga before, it's basically what you're thinking. 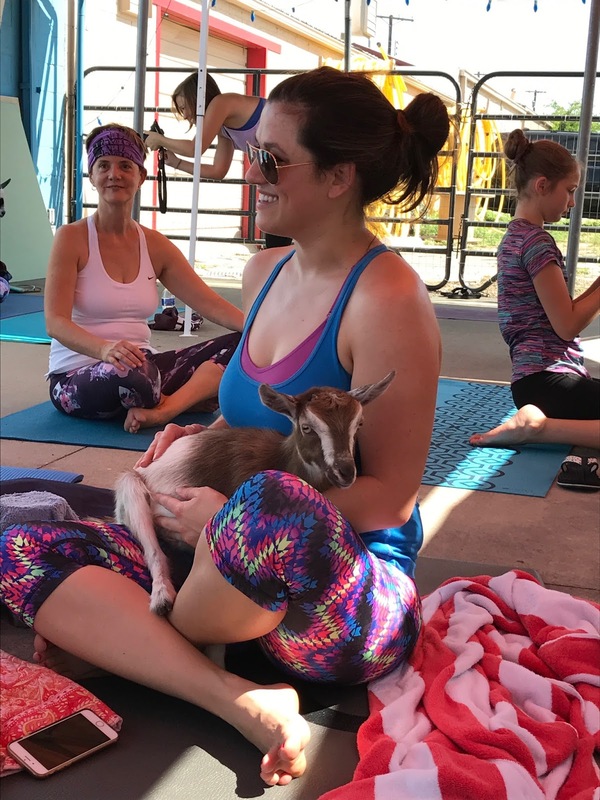 You do yoga with goats. Although you don't really do yoga poses together or anything like that. And you don't get your own goat partner, as I had hoped. 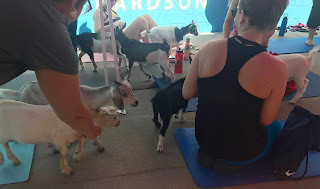 The class I took had about 35-40 people in it, and about 15 baby goats milling around the whole time. 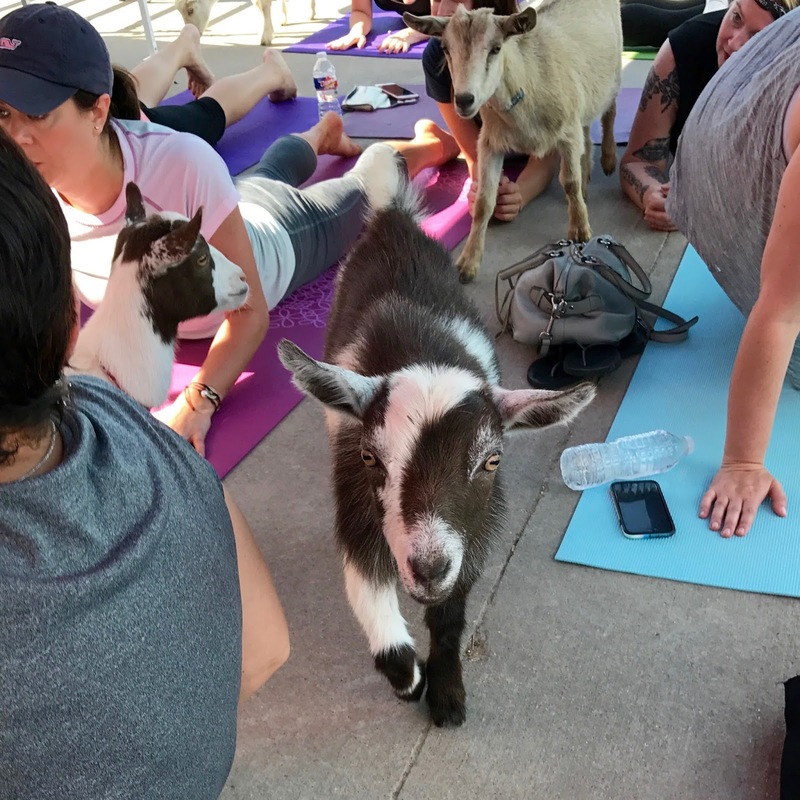 I had read up a little on this whole Goat Yoga movement prior to going to the class and I wondered, "Why goats?" and didn't really get it. Why not Chicken Yoga? Or Kitty Yoga? But now, I sorta feel like I get it. Goats are gentle, they don't make noise, they aren't fearful of humans, and there's a calm feeling they give off when you're around them. However, there is also a lot of pooping and peeing. But there were a couple of people on site that walked around cleaning up after them constantly. Goats can definitely be lured by food, so there was food there to encouragement them to walk around so everyone in the class had interactions with the them. My friend Theresa had a little cup of trail mix so she was quite popular. We learned that they don't really care for pretzels. No one cares about pretzels. I guess goats like jumping up on things, and some of us were lucky enough to have our backs jumped on. They're lightweight and gentle so it's not painful at all to have a goat jump on your back. Much better than a monkey. ommmmm. I've got a goat on my back! I will admit, this moment made me slightly nervous, but mostly happy. I've never been in a yoga class where time flew so fast! The goats were so cute that every now and then I'd forget that, "hey! 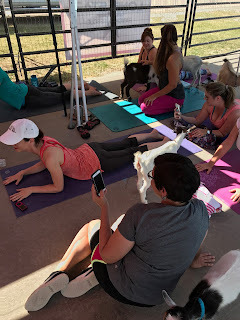 there's a yoga teacher here giving us instruction." We were all pretty busy petting goats and getting cute pics with our cameras. As one girl said after class it was actually, "Playing with Baby Goats with a Side of Yoga". I wouldn't really say I got that much of yoga work out. But seriously, who cares? 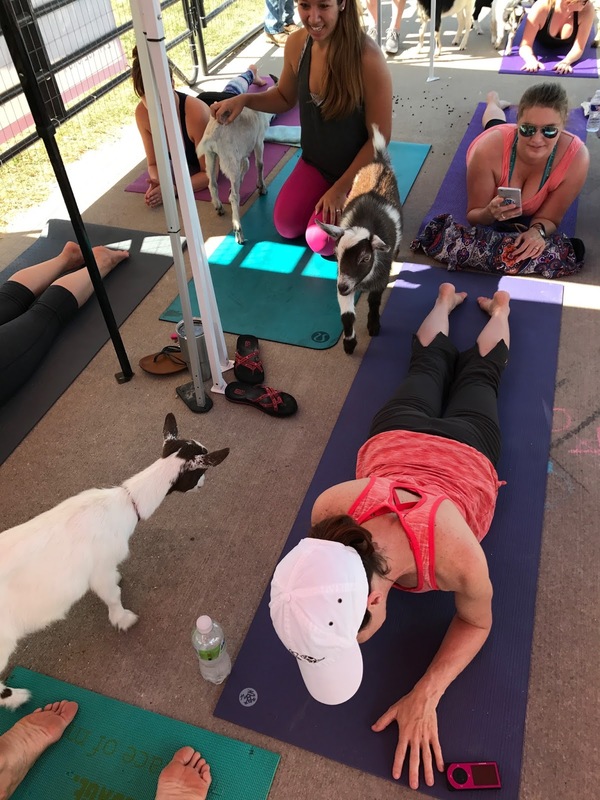 Sometimes it's more about the the goats than the yoga! 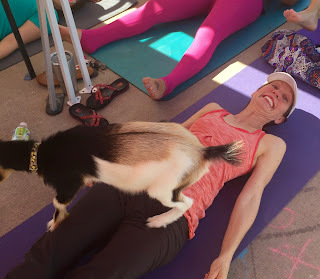 My friend Theresa, with her new favorite yoga partner. Yoga with goats! that is something worth trying. I am sure that everyone involved loved the experience. Hope that they conduct similar sessions in my region. I am feeling terribly glad concerning telling you concerning the yoga welfare center; this yoga Sandnes is that the best yoga center in keeping with my purpose of reading and yoga expertise. Kind this place everybody will learn the simplest yoga techniques for creating their body relax and calm.